We have stayed there many times and found it very convenient. Good value for money. 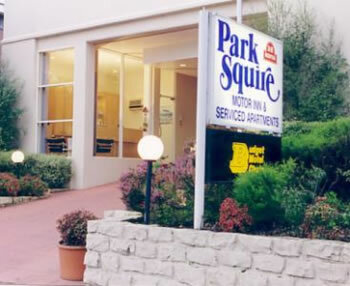 We had a comfortable nights stay at the Park Squire Motor Inn . The room was clean and perfect for our one night stay, in a great location for us to get to early Morning appointments at the Royal ChildrensHospital. We would stay here again . The room could do with a little touch up paint wise, there were a few large bubbles under the paint (water damage?). The place was well maintain and washing machine was easily accessible. Parking was fine. The rooms were always clean and bed was comfortable. Only thing lacking so far would be a safe and hangers that could be removed from the wardrobe. Great area near park and transport. Despite property being on tram route and busy road, it is pretty quiet. Fine. easy booking clean apartment a little run down but comfortable. One night only - had everything we needed. close to park and public transport. Not fancy but clean and comfortable. Very adequate for our requirements. Very good. Repeat customer - never had an issue. Basic room but clean and tidy. Reasonable price with free undercover carparking which is very convenient. Close to public transport. A couple of minor maintenance issues with the room (e.g. shower door handle was held on with sticky tape) but overall its clean and good value for the price. Really happy with the room, nice and clean. Bed and pillows were really comfortable. Close to hospitals and the tram stop into the city. A very clean and convenient place to stay. Very good value for money. Generally stay was good. Only minor issue timber stairs make quite a bit of noise when in use by foot traffic. Accommodation clean & affordable, friendly staff. Everything was good, but the matrass protector was durty. Might be the best hidden secret on the edge of the city. If you want new and shiny don't bother, if you want comfortable value for money stay that's close to everything this is the place for you. Clean and neat room, very quiet considering the busy roads, great location, perfect for what we needed. Will stay again. It was extremely good. Everything was practically perfect. Close to the Zoo and public transport was only just up the road, which meant we weren't too far from the city. It was also easy to find. It was a great place to stay and really good value for money too. Our stay at the Park Squire was comfortable and very convenient to where we needed to be during the day ( SNHC) Whilst I originally booked for 3 people, when a 4th bed was needed at short notice, the staff were happy to accommodate our needs. Had an enjoyable stay, but could not believe that you charge a 13 month old boy at adult rate. THE ROOM WAS CLEAN, THE BED COMFORTABLE THE LOCATION WAS GREAT BEING NEAR A TRAM STOP AND WALKING DISTANCE TO THE RAILWAY STATION . EXCELLENT VALUE FOR MONEY. Very good value for money. We'd stay there again. Suited our needs very well. Was very good - clean, friendly, good location for what i was there for. Cant fault it. Very good value for money. A bit rough around the edges ie thin towles, leaking taps, gaps in external doors and a toilet seat so old it was almost worn through.